The Talent of Luka Bloom Begins to Flower - The Irish singer's electrifying solo acoustic set at the Coach House is a tour de force that has hints of greatness. A Song in the Dark :: In this third part of the Oor series on Loners and Outlaws, Poets and Tramps, Troubadours and Protest Singers, or, in short, singer/songwriters we close the circle. Eighteen artists were given special attention, many names were mentioned, and this was only the tip of the iceberg. Like no other singer-songwriter does Luka Bloom know how to win over an unknown audience, as he proved at various rock-festivals. His new album is finally in the shops and next week he is back on our national stages. Talking to a lonely cyclist. "I'm knackered", Luka Bloom sighs, while he lowers himself into an office chair. His shoes are under an oval meeting table, strewn with cups, glasses and bottles and a plastic tray with the last remaining sandwiches. It is near the end of a gloomy day in December, and the vigorous and cheerful Irishman has already talked to six journalists. In between he has also treated the staff of the Hamburg office of his record company to a mini concert, a taste of the album Acoustic Motorbike which has just been released. Exactly two years we have had to wait for the successor to Riverside, and it is understandable that he took his time, because that album can definitely be called the most impressive debut album of this decade so far in the singer-songwriter category. On stage Bloom doesn't show any less power of expression, considering the fact that during the last Pinkpop Festival he effortlessly held his own among the electric violence of Walter Trout and Living Colour. His powerful acoustic guitar playing and expressive singing are undeniably rock and roll, all the more reason why Acoustic Motorbike sounds subdued. From someone who in the space of nine months performed in 115 cities in eleven countries, you would not expect such an intimate album, certainly not when you consider his dynamic live rendition of L.L. Cool J's I Need Love. "But it was precisely that song that was my starting point for writing my new repertoire", he says. "Live I gave that rap a slightly humorous twist, but on a record that kind of interpretation doesn't work, so I decided to record it as if I was whispering in someone's ear. If you listen to music at home, you would, after all, do that on your own most of the time." "I've deliberately chosen the life of a solo artist", Luka Bloom says. "If you tour with a band, you would automatically spend nearly all your spare time with your band, while I prefer to meet interesting people. Also, you experience more than with a regular company, which provides you with material for lyrics. I've never really felt lonely or lost in a strange city, because my curiosity always overcomes all my other moods." Bloom does not boast about this in the least, because if you check his history it turns out he travelled all over the place in his twenties. About ten years ago he spent a few months in the Netherlands, and if you mention Utrecht he will immediately remember a few cafes and clubs where he once appeared as a little known folk singer for a few guilders. At that time he didn't use his current name, even though he didn't advertise the fact that he was the youngest brother of the famous Christy Moore. Who listens to the albums Barry Moore released through unknown record companies will notice immediately that his style of guitar playing has changed completely. "Until I was 25 years old I had only ever strummed my guitar, but because of some trouble with my muscles I was forced to learn a new technique, and I had to use a plectrum", the 36-year old explains. "At that time Irish folk music became less interesting to me, in the sense that from then on I also wanted to make a different kind of music. Once I had realised which road I wanted to take I decided to change my name and to try my luck in the United States." Just over five years ago Bloom arrived in New York, a city which gave him a huge culture shock, and so he travelled straight on to Washington DC. Because he didn't want to seek refuge in the both safe and sheltered folk scene, which he describes as a kind of civil service, he offered his services to small clubs which had no specific musical identity. Strengthened by a fast growing response, he soon commuted to Manhattan once a week, and he moved there a year later. After Bloom had toured the US and Canada as support act for The Pogues and the Hothouse Flowers he signed a contract with a major record company. When Riverside was released at the start of the nineties Bloom had moved back to Dublin, though his career is still firmly based in New York. "It is because I cannot be without my family, but apart from that I am not that attached to Ireland that I could not live somewhere else. ", he says. On the other hand, I cannot do without the hectic city life either, because, although I grew up in the country, all that space makes me claustrophobic. "Pedal on, pedal on, pedal on", Bloom sings in the title track of Acoustic Motorbike, while we hear him cycling through the Irish countryside, where he withdrew for a couple of months last year in a small cottage to work on the new album. "The songs came out spontaneously. The muse might not have wanted to accompany me on my tour, but that didn't mean she wasn't waiting for me at home", he says. "I don't think I will ever run out of inspiration as long as I can interact with my fellow human beings and I make myself sit down and write at the right time and with the necessary generosity in my heart." Bloom's lyrics show an undeniable humanity, considering especially the fact that he is concerned about the welfare of others, even if things are not going well for him. "You could call me a romantic, though I am not deluded, because there is a sense of desperation about the state of the world in my songs," he knows. "And what is the point of drowning in your own sorrow? If the physical love between two people ends, they can still continue to care for each other and that is what you can hold on to." Talking about his work Bloom inevitably becomes a little pompous, but in his lyrics he shows that he does know how to limit himself, and the same goes for his music, because just like Riverside Acoustic Motorbike does not have a single note too much. "A good song can be spoilt by too much instrumental decoration. All these overproduced records these days make me think of beautiful faces whose natural beauty is hidden beneath a thick layer of make up," he says. "I want to make my music sound big using as few aids as possible." SAN JUAN CAPISTRANO - "The Irish Never Quit!" say the soap ads, claiming a lusty sweat as the prime birthright of Irishmen ("Arrr, and their woomen too!") as they frolic themselves into a rustic lather. This is pretty much the kind of coverage the Irish get: trivialized stereotypes in commercials -- further proud examples being those swillers of St. Paddy's green beer and the Lucky Charms cereal dwarf--and headlines about car bombs and snipings ("The Irish Never Quit!" indeed). That Celtic folk possess a deeper character and tenacity is borne out by the work of Joyce, Yeats and Van Morrison, and it may be only a question of years before Luka Bloom's name can comfortably hang out with theirs. The Irish singer's solo acoustic show at the Coach House on Thursday night had hints of greatness to it. Like his brother, folk renegade Christy Moore (Bloom was born Barry Moore), Bloom has a deeply romantic and distinctly Irish voice, full of the expansive spirit yet shadowed by "the troubles" of his sundered nation. Although his lyrics and patter at times recalled the droll whimsy of Lyle Lovett, there was no undercutting the engagement and emotion he brings to a song. Bloom is one of the most electrifying acoustic performers around: His hard-driving delivery typically had him flailing at his guitar strings as the rhythm propelled him about the stage. And, in fact, his acoustic guitar was wired for a variety of electronic effects. The heavy compression and chorusing in many instances allowed a hypnotic swirl of sound and synth-like bass lines to emerge from his instrument. But it also made one wish sometimes for the nuance and expression of an unadorned guitar. At certain points, only his marvelous voice saved the arrangements from sounding like a '70s Al Stewart album gone mad. Bloom's 18-song set drew chiefly from his current "The Acoustic Motorbike" album, with a few songs from his 1990 debut "Riverside" and covers of T-Bone Burnett's "River of Love" and the traditional "Black Is the Color". It was a tour de force performance, although he ignored what arguably are his strongest songs -- "The One" and "This Is for Life" from "Riverside". "For Life", about a love that reaches through prison walls, may be one of the most achingly beautiful folk tunes of the present generation. One of the songs that Bloom did perform was L.L. Cool J's rap "I Need Love", not something you hear an Irish guy with an acoustic guitar do every day. But Bloom delivered the romantic number compellingly, in dead earnest with no hint of novelty. His own rap-inspired tunes, "Bridge of Sorrow" and "The Acoustic Motorbike", seemed more derived from Murray Head's 1985 singsong "One Night in Bangkok" than from black American rap. "Motorbike" did, though, prove to be a kinetic re-creation of a wide-eyed, tired-thighed cycle trip through Bloom's homeland. After years in the States, Bloom, who is 36, only recently returned to Ireland, where he, like many others, had been driven by the lack of opportunity and stifling social conditions at home. "This Is Your Country" was a plea for his countrymen to return; it didn't gild the shamrock as it acknowledged the heart-tug for home even in this "age of the cruel and unkind"
He wrote "Listen to the Hoofbeat", Bloom said, after seeing a documentary on American Indians' suffering. Rather than fill the song with true-but-tired rhetoric, he came up with a galloping celebration of the freedom that characterized America before the Europeans arrived, making his point through the contradiction between that spirit and the paved world we now inhabit. The song showed Bloom at his most abandoned, letting loose with war cries and strumming at a dead heat. His set touched on the tragic, particularly in "Mary Watches Everything" and its tale of a woman whose world moves or changes only on her TV. Offsetting that, though, was the unabashed devotional romanticism of "I Believe in You", "Exploring the Blue", "Rescue Mission" and also a relatively hushed version of the Elvis staple "Can't Help Falling in Love". Bloom, who played to two standing ovations, concluded the show with a sing-along of a new song Waterboys leader Mike Scott gave him -- "My Sunny Sailor Boy". Even a full band might have been hard-pressed to share the stage with an energetic performer such as Bloom, and local singer/songwriter Amie Bovee, who played the opening set, wasn't quite up to the challenge. A couple of her songs showed promise -- notably her craftily melodic "Loving You Too Much" and torchy "Breakdown" -- but most of that promise may be some time in redeeming. Most of her songs seemed over-long and over-sung, with blocky harmonic structures not holding up under repeated verses and vocal workouts only rarely animating her lyrics. "I had been looking for ways to break out of the singer-songwriter-folkie mold," said Luka Bloom. "So I turned to rap. Let's just say I play Irish-industrial-folk music with rap overtones now." Let's just say he's kidding. He does incorporate some of rap's verbal syncopation in his songs, but no one who has heard Bloom sing would mistake the Irish musician for a rapper, much less an industrial artist. The folk peg is more like it, although he doesn't fit neatly into that category either. His work is more acerbic than that of his brother, folk singer Christy Moore. Bloom is a literary lyricist who generally gives tender deliveries of his songs, but he isn't above mocking rock with wry words and cynical renditions. Listen to the coy "An Irishman in Chinatown" and try to resist grinning. Although panned by the critics as musical fluff, the song is one of his most requested numbers at concerts. Chicago fans will get the chance to ask for the song when Bloom, who is touring to promote his current LP "Acoustic Motorbike", hits the Park West tonight for a solo gig. "Some people who sing and write songs are almost afraid to allow silliness to come out because they feel it might diminish their artistry," he said. "I decided from the beginning I would have some silliness on my records because there's a lot of silliness in me. I also tend to write a lot of serious (songs) too, but if you don't balance it out, it's not really representative of who you are." Rap is about as foreign to Ireland's music scene as Korean food was to Bloom when he came to America, but the genre was one he found challenging and wanted to sample, if not conquer. "I come from Dublin, where 99 percent of the people are of Catholic extraction and white," Bloom said. "Ireland's exciting, but from a cultural melting-pot point of view, it's like a bowl of porridge. So when I moved (for two years) to New York, I got introduced to rap, which I found fascinating. I found myself very drawn to the sound and over-all groove of rap, so I decided to have a shot at it myself. I went looking for a (rap) song that I could incorporate into my groove and give people a different perception of what a singer-songwriter could sound like." He found it in LL Cool J's "I Need Love". His interpretation of LL's song is all but unrecognizable from the original. Romantic, longing and surprisingly deft for an Irishman who'd never rapped before, the song also gets an exotic flair from Christy Moore's manipulation of the bodhran, a traditional Irish drum. "It was very exciting for me incorporating different cultural aspects on this record," Bloom said. "It was like learning a new language in a way. Rap has gotten a lot of flak for being a very simplistic art form, but it's technically very difficult to get the phrasing and rhythms right, and still inject the proper emotion." "I Need Love" gave him the confidence to write his own pseudo-rap song, "Bridge of Sorrow". Using both rap and smoky vocals, Bloom captures both the pathos and beauty of his words without sounding like a hesitant ingenue. "Yeah, I guess my next step is making a disgusting sexist video for MTV," he said, laughing. "But my treatment would have to be very different. For an Irish rap song, we'd have to get green babes. No, I go for the pretty soft videos, which I hope aren't too schmaltzy. But as long as it doesn't get mistaken for one of Michael Bolton's, I'm fine." 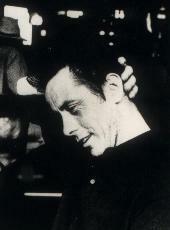 There is such strength and purity to Luka Bloom's music that a band could only diminish the conviction of his songs. Standing alone on a barren stage at the Park West Friday night with just his electro-acoustic guitar for accompaniment, Bloom gave a sly but powerful performance that ended all too soon. Bloom is a child of folk music who understands the rhetoric of rock 'n' roll. The frenetic guitar playing on "The Acoustic Motorbike", which he sang for his first encore, is as vibrant as anything the Pogues ever came up with. His lilting vocal delivery of "Gone to Pablo", a graceful, mournful song about the suicide of Picasso's widow, matches Suzanne Vega breath by breath. The Irish musician also is an original artist who makes covers all his own. By adding syncopated rhythms and distanced passion to "Can't Help Falling in Love", he gave new life to Elvis Presley's decades-old song. Likewise, his version of LL Cool J's "I Need Love" was almost unrecognizable from the rapper's version. As his brogue gently rolled the syllables together, Bloom drew out the romanticism of the lyrics that sounded cynical when LL rapped them: "I watch the sunrise in your eyes / So in love when we hug we feel paralyzed / Our bodies explode in ecstasy unreal / You're as soft as a pillow, I'm as hard as steel." When members of the audience starting clapping along, Bloom's rapier wit surfaced. "Listen, if I wanted a drummer, I would've brought Ginger Baker along," he said, good-naturedly. Bloom's synthesis of rap's lyrics and folk's melody surfaced again on "Bridge of Sorrow". There is a churning urgency to the provocative number that showed his flirtation with rap was well-founded. There has come to be an expectation from Irish musicians to wear their socio-political beliefs on their sleeves, but Bloom refuses to conform. His liberal views are sprinkled through his albums "Riverside" and "The Acoustic Motorbike", but it's the listener's job to find them. Much of Bloom's material projects heartbreaking melancholy and longing. He is among a handful of artists who can capture the enthusiastic spirit of his live shows on record, and who also can translate the pristine studio techniques in concert. Onstage, Bloom is louder and funnier than on his moody albums. "I hate this place," Bloom dead-panned, looking out into the standing room-only crowd early in the hour and 40-minute show. "It's so ugly in here." Backstage, Bloom explained he and his road crew have gotten into the habit of saying exactly the opposite of how they feel. In that case, we hate you, too. Don't ever come back. In the annals of pop music, there have been precious few songs written about cycling. 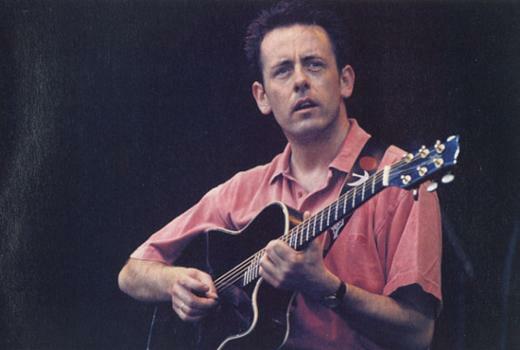 So it was noteworthy when Luka Bloom a 37-year-old Irish singer/songwriter, released an album called The Acoustic Motorbike earlier this year. The album cover shows Bloom riding his mountain bike, and the title track is both a celebration of the pleasures of cycling and a pointed reminder of the bicycle's environmental purity. "Get up on your bike! Pedal on, pedal on, pedal on for miles," Bloom repeats over his rumbling acoustic chords. When we caught up with him near the end of his recent six-week American tour, Bloom enthusiastically granted an interview, saying he was weary of standard music-oriented interviews but eager to talk about cycling. As he ate a macrobiotic vegetarian meal and fingered a burgeoning hole in his jeans, he expounded on the message of "The Acoustic Motorbike". Here's a question that all cyclists ask one another: What do you have for a bike, and how long have you been riding? "Well, I've always owned reasonably good bikes. I bought a Muddy Fox Pathfinder about two years ago. It's a really light bike and really useful for the city. Then Muddy Fox donated the bike that I used on the album cover, a Mega Sorcerer. It's a really cool bike. I am thinking of getting something different for the streets. You have a much better range of bikes over here. I've seen some incredible bikes in places like Boulder. I've ridden a bike since I was eight or nine, really. I'm not an avid cyclist in the sense that I don't spend all my free time cycling up mountains. I don't go for 100-mile cycles every other day. I cycle in the city, and I go for cycles in a leisurely sort of way. But it wasn't until recently that it became something that I got serious about - serious in the sense of it taking on a whole new meaning for me." Was there a chain of events that prompted this change in your attitude? "Yeah. I remember when I toured after my first album, Riverside, came out two years ago. I just became completely horrified at the sheer volume of traffic everywhere - not just in America, but all over Europe. Everywhere I went, I would be driving for five or six hours between cities, and then I would get to the city and wait in traffic for another hour and a half to get to the hotel and the club. I found myself realizing that when I sat behind the wheel of a car, particularly in cities, a bit of a monster came out in me. It affected me in a way that made me feel really guilty about driving a car. When I came back from that tour, I moved from outside Dublin into the city so I could cycle rather than depend on driving. I also decided to go for cycles around the west of Ireland on my own. It was great. During that time, I started to think about writing a song about it." And that turned out to be "The Acoustic Motorbike"? "Right. The idea of the acoustic motorbike came about, funnily enough, when I was talking to my managers and one of the guys from the record company about what it is that I do and what it is that makes me different from say, rock and roll, or from folk music. We were talking about how it's not really one or the other, but it's something in between. So you have the Harley-Davidson, for example, as a symbol of rock and roll. Well, a mountain bike is a symbol of what I do. And one of my managers said to me, 'It's like an acoustic motorbike.' It's a motorbike, but the motor is the human power, and that makes it acoustic. I thought it represented a very interesting visual image for what I do. That idea stuck with me. So then went I went on this cycle around the west of Ireland, I decided to write a song, and then decided it was a great idea for an album cover." You could have called the album anything, used any cover art. But you chose The Acoustic Motorbike and a photo of you riding. "Yeah, it was very deliberate. I wrote the song during the Gulf War. And that whole thing to me was so much about oil, and so much of our life in the Western world is about abuse, misuse and overuse of the planet's resources, that I wanted to do something that represented a statement, but that was not like standing up on a platform and preaching. I don't make big political gestures in my music. I don't believe in standing up on a stage and saying, 'You've got to stop driving cars.' Instead of doing that, I say, 'This is what I do: I cycle a bike, and it's much sexier than driving a car.'" "The car companies have harnessed rock and roll in their advertising. They harness something that youth is into, and they make it sexual and therefore make it marketable. So there's all this sexual imagery that surrounds cars - 'Drive this car, you get this babe'. And maybe in the '50s and '60s when the cars were really cool, there was some possibility that they could get away with that. But nobody's going to convince me that sitting in a traffic pileup on Ventura Boulevard is a sexual experience - sharing it with five million other people and their exhaust fumes." So you have noticed that the car is king in Southern California. "It's interesting, the night before I flew over from Ireland to Los Angeles a year and a half ago, I saw a TV documentary about traffic in L.A. It was so frightening. Just the sheer weight of the statistics they threw out there. Like, 70 percent of all space in Los Angeles is taken up by cars, freeways, garages, parking lots. Seventy percent! Or that 100 million miles are driven every day. The amount of oil that's consumed by that." And they've got this great climate there. But people in Los Angeles get in their car and drive five miles to go do a workout in an aerobics class. If people cycled, they could do the fitness thing and make their own statement about how they want their environment to be. It's a very simple, small statement, but it's crucial and valuable to me. In "The Acoustic Motorbike", you start out by saying how riding makes you feel good and finish up with lines like, "Knock down houses, build more lanes, Once was a problem, now it's insane." "Yeah, we now live in a world where cities exist primarily for cars and commerce, not for people. There are some exceptions - some of the Dutch cities have it well sussed out by discouraging traffic in the inner city, encouraging residential life in the inner city and building bicycle lanes. But by and large, cities in contemporary society exist for movement of cars, so roads will be given precedence over housing and resident comfort. And that's absolutely disgraceful. It's something that I feel is worthy of a revolution in itself. The reason I feel so strongly about it is because I live in a city. I love the city. And I don't see that living in the city and being a cyclist have to be contradictory aspirations. Jerry Brown's been talking about taking back America - I think that it's time for people to contemplate taking back their cities. There's so much fun to be had on streets when those streets are occupied by people - whether those people are on skateboards, on foot, or on bicycles. To me, that's what urban life should be about." You say you want a revolution. Will it come from people changing themselves and riding bikes more often, or from the government funnelling money into pro-bike projects and programs? "I don't know about funnelling money into projects because you're up against big business. I mean, car companies, oil companies and road-construction companies are extremely powerful. They have no interest in the idea of cities being built in a way that's sympathetic toward either pedestrians or cyclists. They only exist to make profits. And so the idea of government channelling funds is great in principle, but unfortunately so much of government is controlled by big business that it's very difficult." There are a lot of people who are into cycling just for recreation and who reject the idea that they're making a political statement by riding. "Those people have the right to think whatever they want. I think that's okay. But they should also at least allow other people the freedom of expression. There are a lot of people like yourself who can relate to what I'm trying to say." Are you going to continue to put across this message in your music? "Well, this has become a major thing in my life because of the realization that the world is basically driving itself into extinction. So there will always be in my songwriting an element that reflects my feelings about these things - at least I hope there will be." Aside from that contribution, have you thought about doing other things to promote cycling? "I would love to actively encourage people to cycle to my shows. I might try to do that somewhere in the summertime by figuring out some way of giving concessions to people who turn up at my show on bicycles. I do have this dream of seeing hundreds of bicycles parked outside a club I'm playing at. I would get a great feeling of achievement from seeing that. Like I said, I don't set out to preach things, but it really pleases me that there are people out there who get the message." Rarely have I had such a positive musical experience and so little space to expound upon its glories - but here goes. Loyko were the higher wild card of sorts. This traditional Russian trio were festive most of the time, soberingly beautiful others and won enough enthusiasm from the punctual element of the crowd to warrant an encore. And a riveting one it was too. Then came The Frames. With a splendidly warm and attractive stage presence, they delivered song after song of energetic rock, chock full of both power and charm. If The Stadium security guards hadn't been such kill-joys, the crowd would have been on their feet for "The Dancer", "Last Song For You" and everything in between. A band to be cherished. Then the main attraction. Luka Bloom sings about real issues, about real heroes, and love and life with capital L's. He takes an instrument that millions of people can play, gets down on his knees and makes it sound as if it were created for him alone. The man can wear suspenders and get away with it. Hell, when Luka rolled out the line, "girl, if you're out there, make yourself seen" in "I Need Love", and then scanned the audience intently, it was all I could do to stop myself from getting up and shouting, "Here I am, Luka, way over here in Block N."
It was that kind of performance. Magnificent. The strum-and-hum style of singer-songwriter music that record stores classify as "folk" rests on a few conservative musical notions. Melody is emphasized over rhythm, lyrics form straightforward narratives and personal expression takes precedence over formal experimentation. These simple, unspoken rules make folk a consistently satisfying but often unchallenging genre. It's music that lets listeners sit back, relax and ponder the familiar infinities. That's what folk music was, anyway, until Luka Bloom grabbed hold of it. Mr. Bloom is an Irish performer who would probably prefer to be called a rock musician or even a hip-hop artist, but performing solo on Monday night at the Bottom Line, accompanying himself on acoustic guitar, he fit a surface description of a folkie. His jeans, illustrated with a painting of Malcolm X, displayed his progressive politics; his mellifluous singing of verses devoted to the old themes of love, tradition and survival indicated his affinity to bards ranging from Percy Shelley to Michelle Shocked. Mr.Bloom's crucial difference lay in his musical approach, which overturned folk's values and renewed the form. Although he can deliver ballads with the best of them, Mr. Bloom emphasizes rhythm over melody, building a complex sonic structure around a song's core. Mr. Bloom's airy guitar runs wove an atmospheric web around "A Man is Alive and Breathing", which in other hands may have constituted a simple confession; the song became more like a miniature movie soundtrack. A flamenco strum brought "Not Without You" into the realm of percussive dance music. "Exploring the Blue", with its eerie imagery of self-transformation and expansive chorus, resembled the experiments of the Canadian composer Jane Siberry. At times, Mr. Bloom failed to attain his grandiose ambitions, despite his tremendous artistry. A cover version of Prince's "When Doves Cry" only stimulated longing for the Minneapolis music wizard's more fleshed-out version, and "The Fertile Rock", a bit of new-age environmentalism, came off as overblown. But overall, Mr. Bloom's music gave a thrilling sense of how folk music can adapt to changing times. His use of hip-hop was especially inspired; the evening's standout was a rapid-fire version of L.L. Cool J's "I Need Love" that lived up to the challenge of the original. May more strummers and hummers pick up the gauntlet this feisty artist has thrown down.